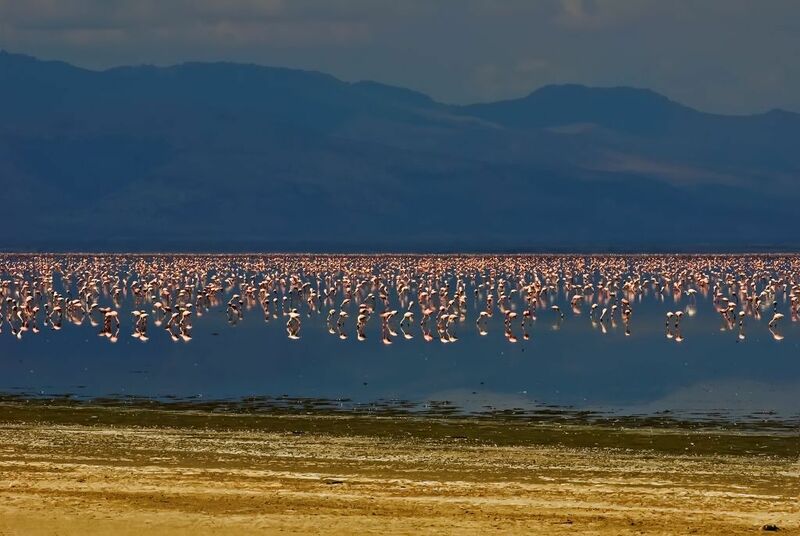 Lake Manyara is nestled beneath the shadow of the Great Rift Valley’s breathtaking western bluffs. The park is little more than a narrow strip of land, yet it protects the area between Lake Manyara and its sheltering bluffs. The lake from which the park derives its name is shallow and alkaline, from the wet to the dry seasons its body expands and contracts within its bed of shimmery salt remnants. Bordering the lake are vast grassy floodplains, while off in the distance groups of varying Acacia Woodlands can be seen. Scattered along the bluffs, small groups of flawless evergreen forests grow, nurtured by the ever present springs, at the base of the bluff. 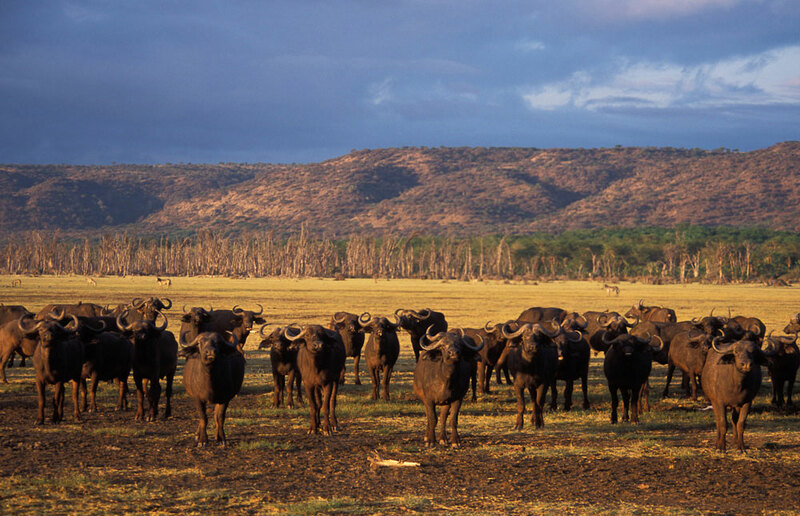 Lake Manyara’s wildlife population is vast, elephant, giraffe and wildebeest can easily be spotted throughout the area. Looking closely along the marshy areas near the springs, may reward you with sights of impala, zebras, warthogs, waterbuck and Kirk’s dik-dik, klipspringer can be found on the slopes of the bluffs. The scattered forests make this land perfect for leopards, the lions love it too. Manyara’s healthy lion population is known for their antics, mainly their tree climbing tricks. 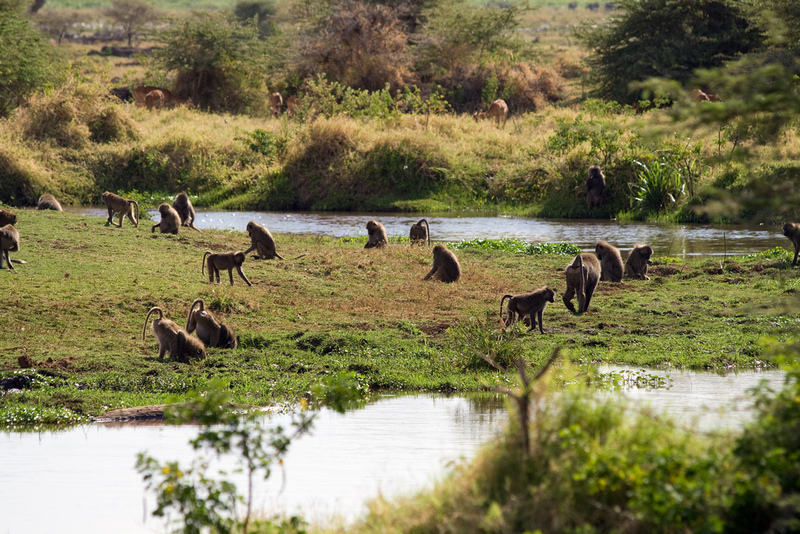 Baboons also inhabit the area, in troops ranging in the hundreds. The bird population here in Lake Manyara is as diverse as the large game population. Flocks of pelicans and flamingo settle in the middle of the lake, while herons, egrets, stilts, stalks, spoonbills and others can be found feasting in the floodplains. Lake Manyara is a bird’s paradise, with its large water supply, birds can be found amongst the woodlands as well, but it’s in the forests where the more attention grabbing species can be found, such as crowned eagles. Lake Manyara is a 3 hour drive from Moshi, a 2 hour drive from Arusha and only 45 minutes away from the Ngorongoro Crater.